The US state of Hawaii is bracing for a dangerous category four hurricane which could hit the islands as early as Wednesday evening. Lane was downgraded to a category four storm, with sustained winds of 155 mph (249km/h), but officials say it is still close to category five strength. Forecasts say the islands will face strong winds and surging waves even if the storm does not make landfall. The last category five storm to come this close to Hawaii was John in 1994. The National Weather Service (NWS) has issued a hurricane warning for the Big Island and a hurricane watch for the islands of Oahu, Maui, Molokai and Lanai as of Wednesday morning. The Navy announced that ships and submarines based at Pearl Harbour will be sent out to sea where they will be "safely out of the path of the storm". Commanders of ships that are undergoing maintenance and are unable to leave port have been authorised to drop anchor, add additional mooring and storm lines, and disconnect power cable connected them to shore. On the Big Island, the first in Hurricane Lane's path, damaging tropical storm and hurricane-force winds could pick up as soon as Wednesday afternoon or evening. President Donald Trump urged those in the path of the storm to prepare and listen to local officials. Intense rain and thunderstorms are also expected to reach the Big Island this morning. Maui and Oahu will see similar conditions as early as Thursday. "Life threatening impacts are likely" to hit Hawaii, regardless of whether the storm makes landfall, NWS said in a statement. Authorities warned residents of major flash flooding, landslides and mudslides, "even in areas not usually prone to flooding". Forecasts predict more than 20 inches (50cm) of rainfall. Rip currents, rough surf, and waterspouts are also concerns along the coasts, particularly on the right side of the storm. Governor David Ige signed an emergency proclamation ahead of Lane's onset, as "the danger of disaster is of such magnitude to warrant pre-emptive and protective action". 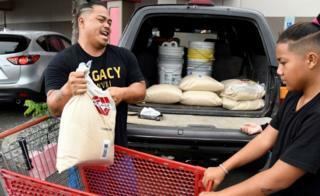 On Twitter, he urged residents to prepare for the storm and said he had "never seen such dramatic changes in the forecast track as with Hurricane Lane". Lisa Bucci, a scientist with the National Oceanic and Atmospheric Administration (NOAA), shared a video of Hurricane Lane from a research plane, noting: "It's a strong and dangerous storm." Hurricanes rarely hit the Central Pacific region, due to currents and water conditions. These storms have always been more common in the eastern US. Earlier this month, Hurricane Hector, a category four storm, also passed by the islands, though it did not come as close as Lane. The Aloha state has also seen serious volcanic eruptions this summer, with lava and ash spewing from the Kilauea volcano on the Big Island since May.